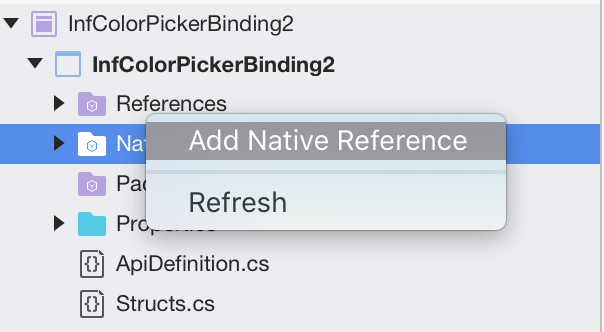 This article provides a hands-on walkthrough of creating a Xamarin.iOS binding for an existing Objective-C library, InfColorPicker. It covers topics such as compiling a static Objective-C library, binding it, and using the binding in a Xamarin.iOS application. 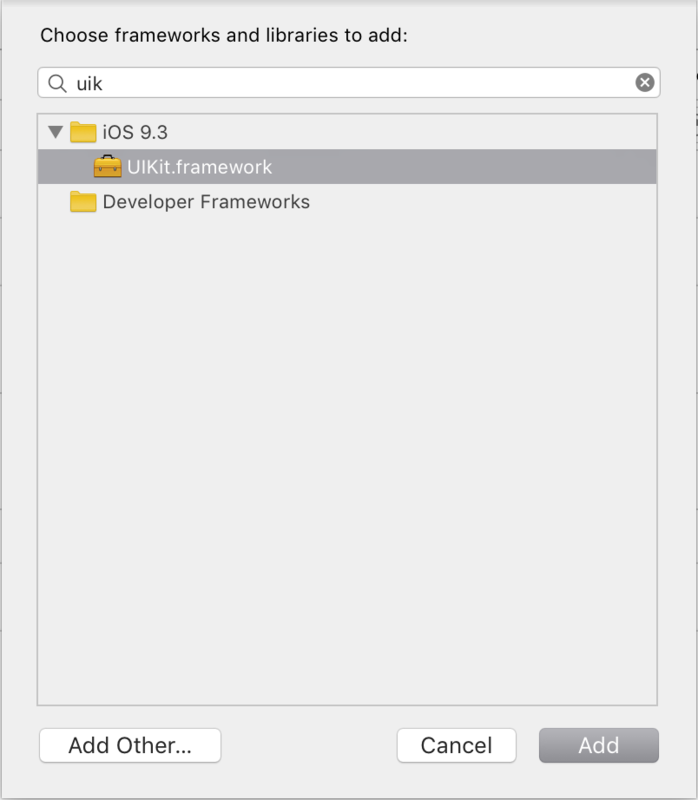 When working on iOS, you might encounter cases where you want to consume a third-party Objective-C library. 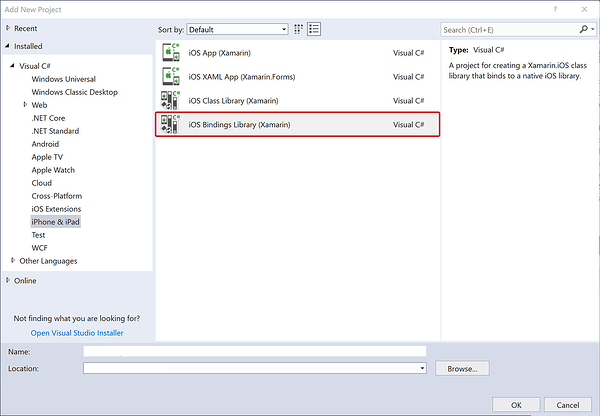 In those situations, you can use a Xamarin.iOS Binding Project to create a C# binding that will allow you to consume the library in your Xamarin.iOS applications. As a precompiled Framework. This is just a folder containing the static library, headers and sometimes additional resources with .framework extension. For example, Google’s AdMob Library. As just source code files. For example, a library containing just .m and .h Objective C files. 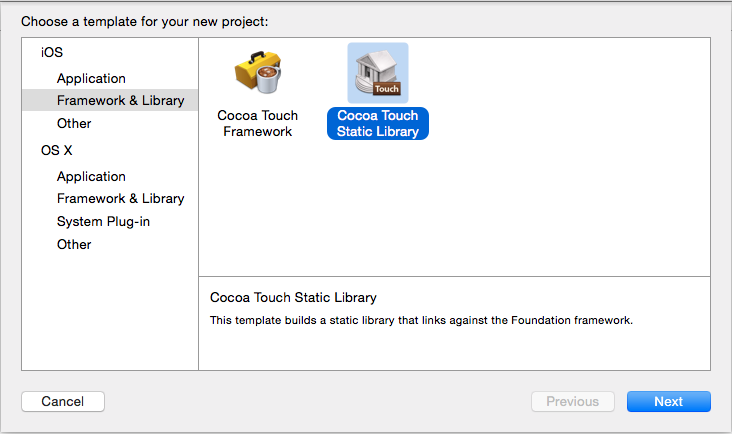 In the first and second scenario there will already be a precompiled CocoaTouch Static Library so in this article we will focus on the third scenario. Remember, before you start to create a binding, always check the licence provided with the library to ensure that you are free to bind it. 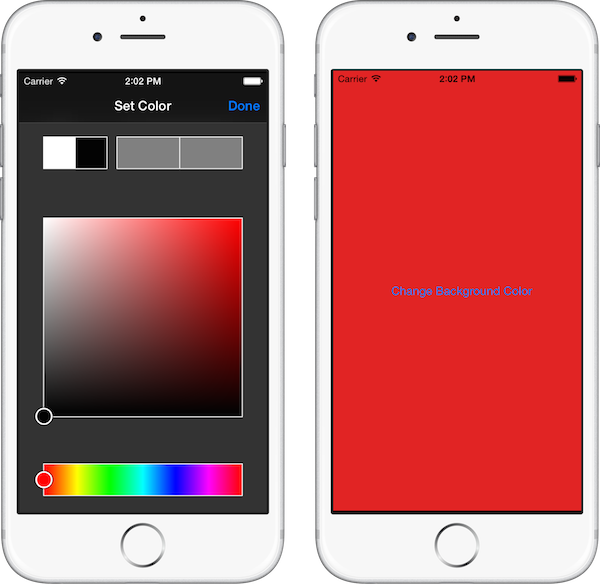 This article provides a step-by-step walkthrough of creating a binding project using the open source InfColorPicker Objective-C project as an example, however all information in this guide can be adapted for use with any third-party Objective-C library. The InfColorPicker library provides a reusable view controller that allows the user to select a color based on its HSB representation, making color selection more user-friendly. First, we'll create an Objective-C static library using Xcode. Then, we'll bind this static library with Xamarin.iOS. 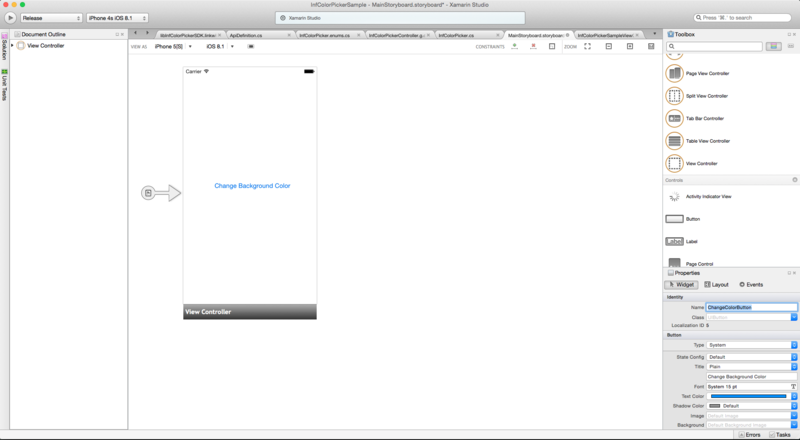 Next, show how Objective Sharpie can reduce the workload by automatically generating some (but not all) of the necessary API definitions required by the Xamarin.iOS binding. 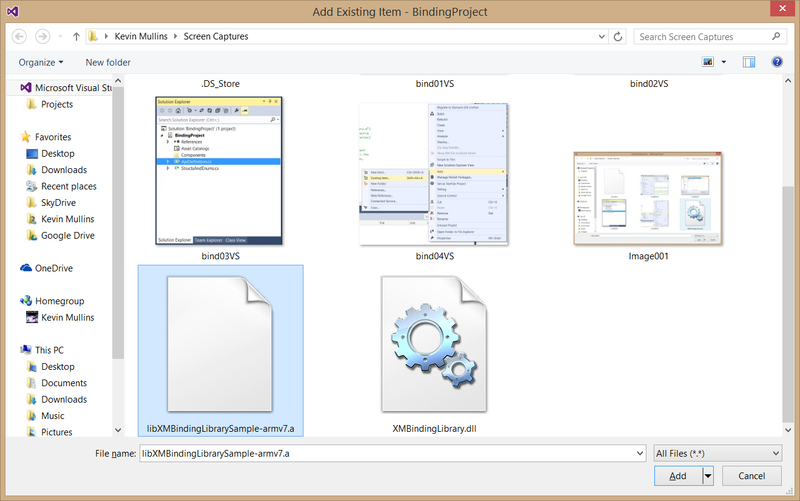 Finally, we'll create a Xamarin.iOS application that uses the binding. 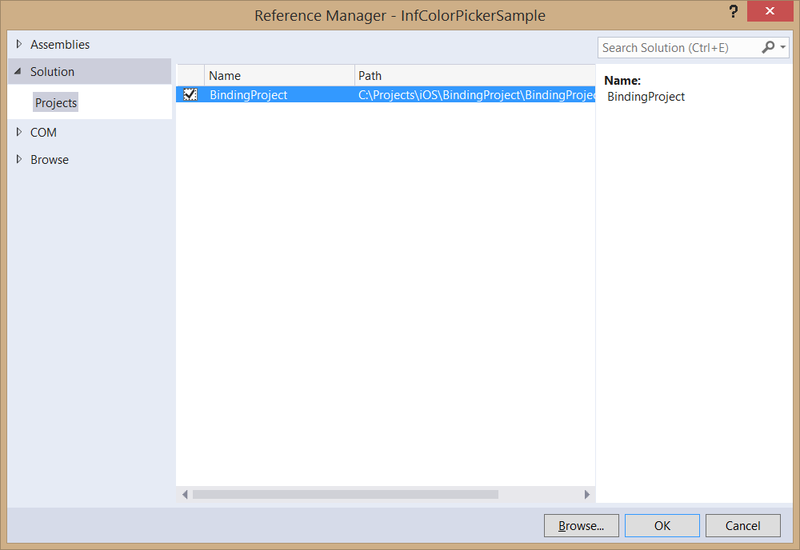 The sample application will demonstrate how to use a strong delegate for communication between the InfColorPicker API and our C# code. After we've seen how to use a strong delegate, we'll cover how to use weak delegates to perform the same tasks. Xcode and iOS SDK - Apple's Xcode and the latest iOS API need to be installed and configured on the developer's computer. Xcode Command Line Tools - The Xcode Command Line Tools must be installed for the currently installed version of Xcode (see below for installation details). As stated above, we'll be using Xcode Command Line Tools (specifically make and lipo) in this walkthrough. The make command is a very common Unix utility that will automate the compilation of executable programs and libraries by using a makefile that specifies how the program should be built. The lipo command is an OS X command line utility for creating multi-architecture files; it will combine multiple .a files into one file that can be used by all hardware architectures. As stated above, we'll be using Xcode Command Line Tools on the Mac Build Host (specifically make and lipo) in this walkthrough. The make command is a very common Unix utility that will automate the compilation of executable programs and libraries by using a makefile to specifies how to build the program. The lipo command is an OS X command line utility for creating multi-architecture files; it will combine multiple .a files into one file that can be used by all hardware architectures. According to Apple's Building from the Command Line with Xcode FAQ documentation, in OS X 10.9 and greater, the Downloads pane of Xcode Preferences dialog not longer supports the downloading command-line tools. 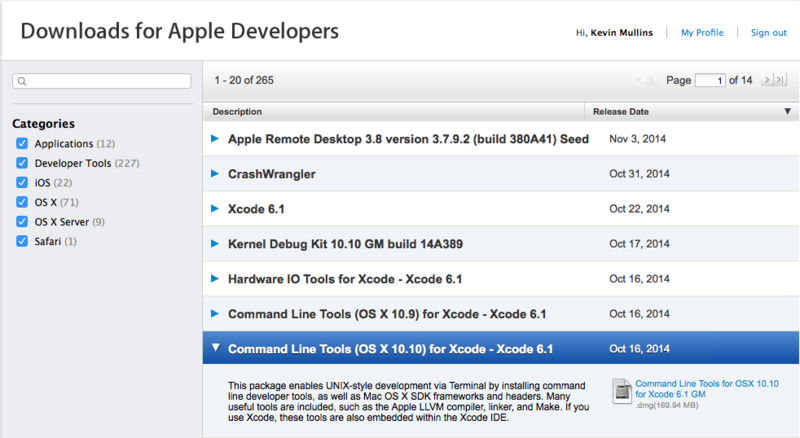 Install Xcode - When you install Xcode, it comes bundled with all your command-line tools. In OS X 10.9 shims (installed in /usr/bin), can map any tool included in /usr/bin to the corresponding tool inside Xcode. 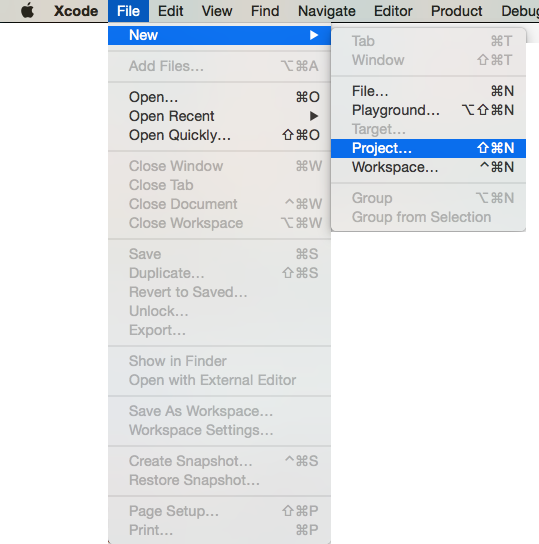 For example, the xcrun command, which allows you to find or run any tool inside Xcode from the command line. With the Command Line Tools installed, we're ready to continue on with the walkthrough. 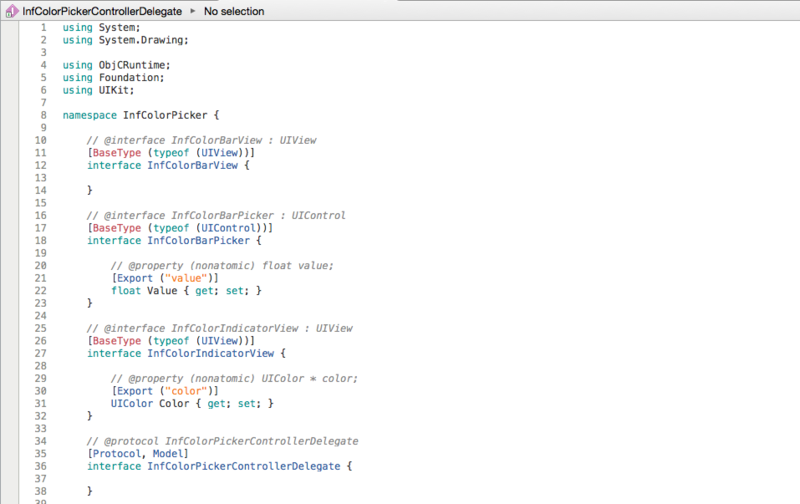 Create a Static Library - This step involves creating a static library of the InfColorPicker Objective-C code. 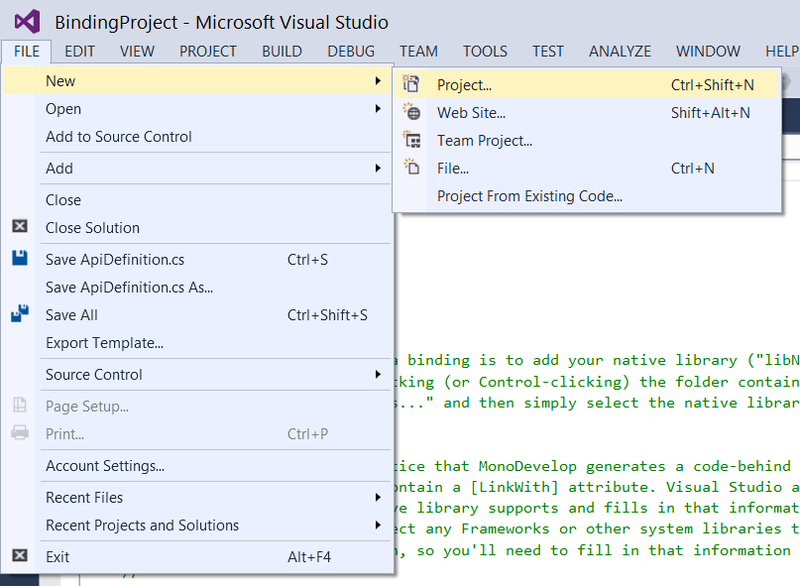 The static library will have the .a file extension, and will be embedded into the .NET assembly of the library project. 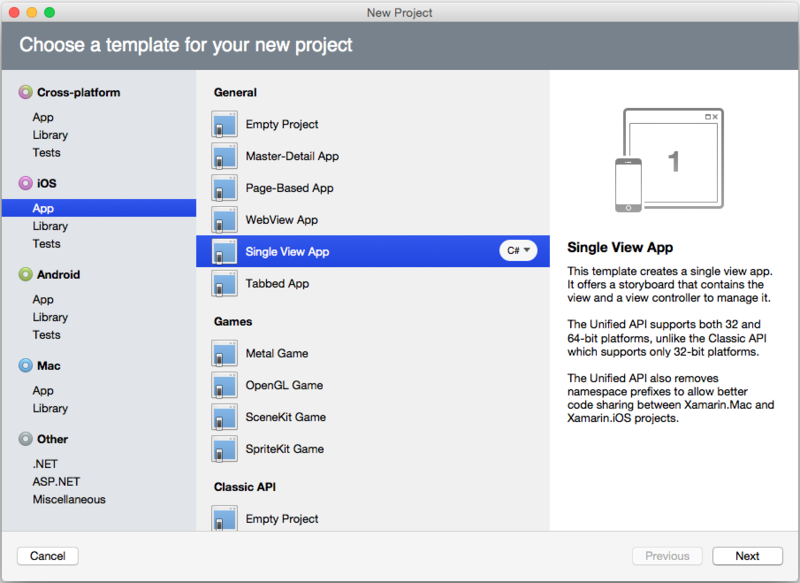 Create a Xamarin.iOS Binding Project - Once we have a static library, we will use it to create a Xamarin.iOS binding project. 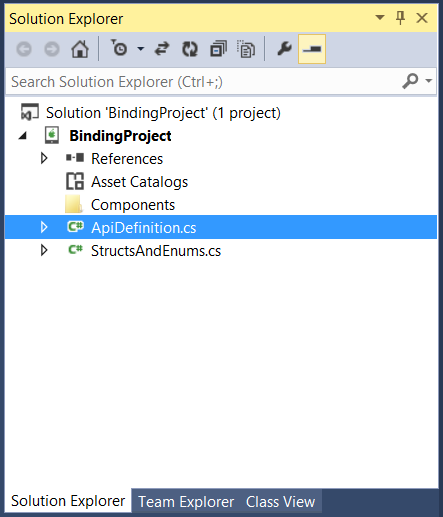 The binding project consists of the static library we just created and metadata in the form of C# code that explains how the Objective-C API can be used. This metadata is commonly referred to as the API definitions. We'll use Objective Sharpie to help us with create the API definitions. Normalize the API Definitions - Objective Sharpie does a great job of helping us, but it can't do everything. We'll discuss some changes that we need to make to the API definitions before they can be used. Use the Binding Library - Finally, we'll create a Xamarin.iOS application to show how to use our newly created binding project. Now that we understand what steps are involved, let's move on to the rest of the walkthrough. 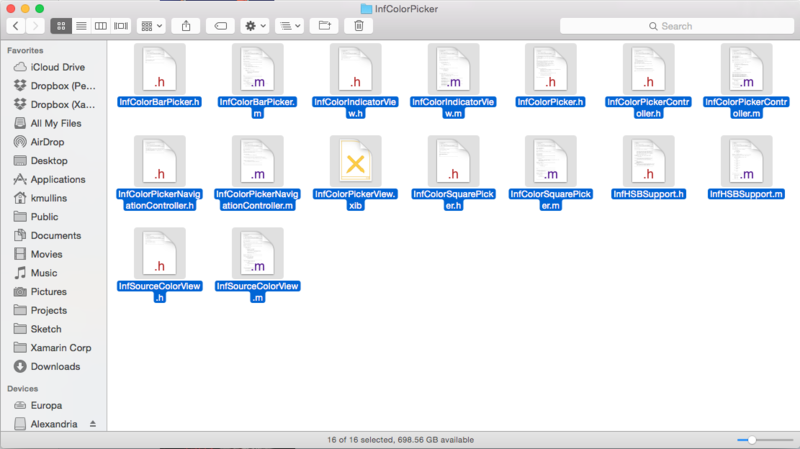 InfColorPicker - This directory contains the Objective-C code for the project. PickerSamplePad - This directory contains a sample iPad project. PickerSamplePhone - This directory contains a sample iPhone project. This project achieves code reuse by directly adding the InfColorPicker source code (in the red box) into each sample project. The code for the sample project is inside the blue box. Because this particular project does not provide us with a static library, it is necessary for us create an Xcode project to compile the static library. 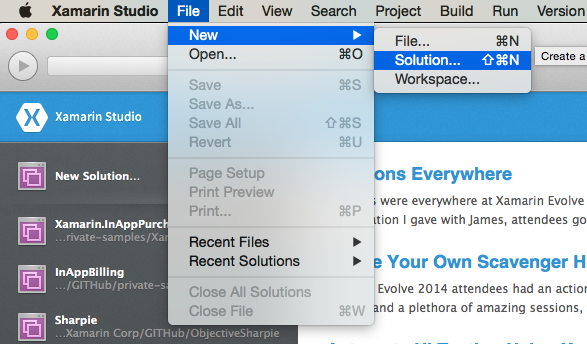 Select a location to save the project and click the OK button. We now need to check if there are any Frameworks required by the library. You can find this information either in the README, or by opening one of the sample projects provided. This example uses Foundation.framework, UIKit.framework, and CoreGraphics.framework so let's add them. At this point we're close, but we're not quite done. The static library has been created, but we need to build it to create a Fat binary that includes all of the required architectures for both iOS device and iOS simulator. All iOS devices have processors powered by ARM architecture that have developed over time. Each new architecture added new instructions and other improvements while still maintaining backwards compatibility. On iOS devices we have armv6, armv7, armv7s, arm64 instruction sets – although we no longer use armv6. The iOS simulator is not powered by ARM and is istead a x86 and x86_64 powered simulator. We that means for us is that we must provide libraries on each instruction sets. A Fat library is .a file containing all the supported architectures. Compile an ARM 7 & ARM64 version of the static library. Compile an x86 and x84_64 version of the static library. Use the lipo command line tool to combine the two static libraries into one. While these three steps are rather straightforward, and it may be necessary to repeat them in the future when the Objective-C library receives updates or if we require bug fixes. If you decide to automate these steps, it will simplify the future maintenance and support of the iOS binding project. Enter the Makefile commands in the plain text editor of your choosing, and update the sections with YOUR-PROJECT-NAME with the name of your project. It is also important to ensure that we you paste the instructions above, that the tabs within the instructions have been preserved. At this point, we've completed the first step of our iOS binding by creating a static library using Xcode and the Xcode Command Line tools make and lipo. Let's move to the next step and use Objective-Sharpie to automate the creation of the API bindings for us. Before we can use Objective-Sharpie to automate the binding process, we need to create a Xamarin.iOS Binding Project to house the API Definitions (that we'll be using Objective-Sharpie to help us build) and create the C# binding for us. 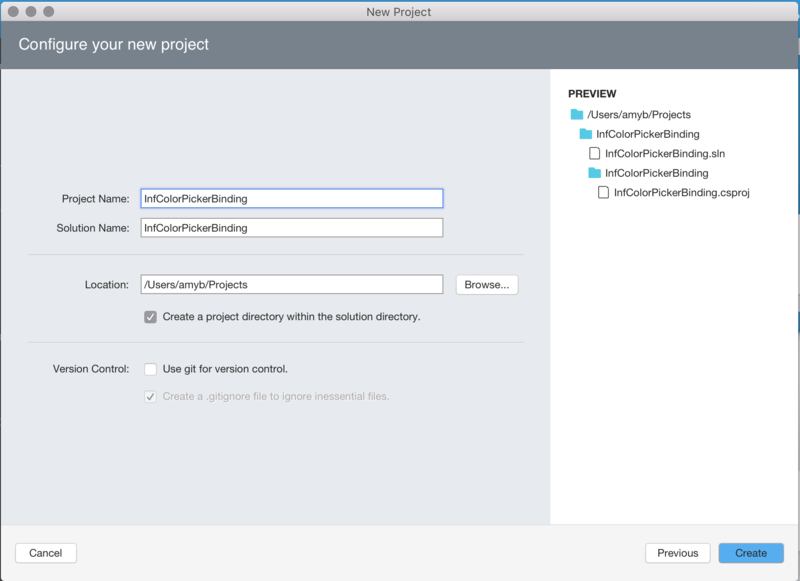 Start Visual Studio for Mac. 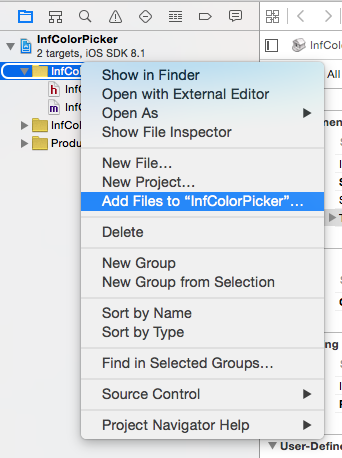 Enter "InfColorPickerBinding" as the Name and click the OK button to create the solution. 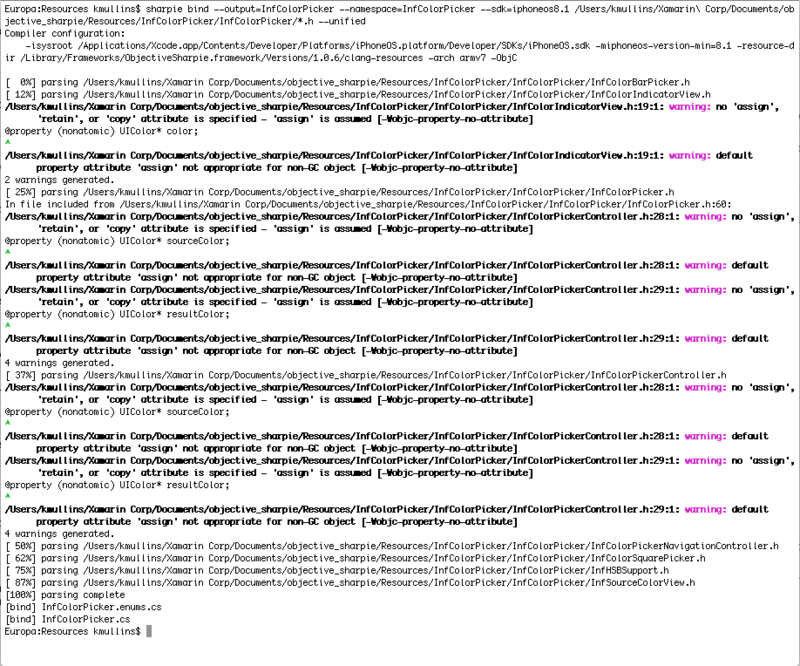 ApiDefinition.cs - This file will contain the contracts that define how Objective-C API's will be wrapped in C#. Structs.cs - This file will hold any structures or enumeration values that are required by the interfaces and delegates. We'll be working with these two files later in the walkthrough. 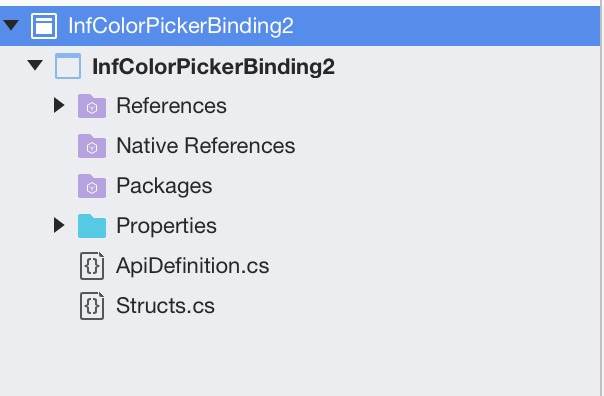 First, we need to add the InfColorPicker library to the binding project. Now we have our base Binding Project ready, we need to add the Fat Binary library we created above for the InfColorPicker library. 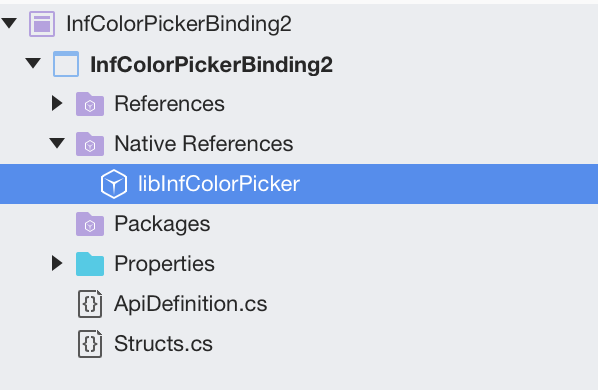 Copy the libInfColorPickerSDK.a from your Mac Build Host and paste it into your binding project. The file will be included in the project. 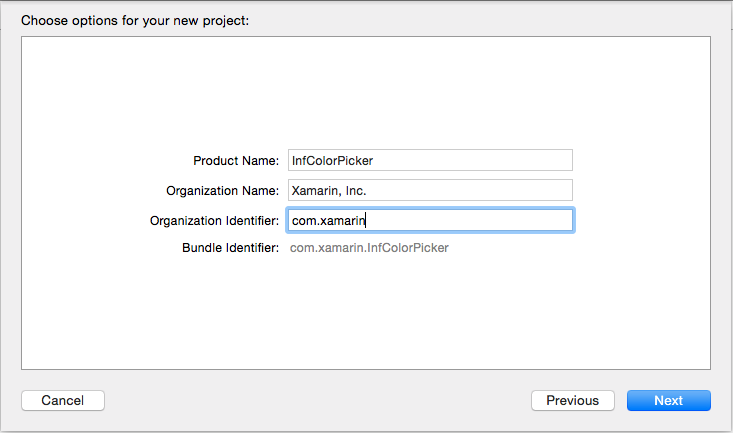 When the .a file is added to the project, Xamarin.iOS will automatically set the Build Action of the file to ObjcBindingNativeLibrary, and create a special file called libInfColorPickerSDK.linkwith.cs. The LinkWith attribute identifies the static library for the project and some important linker flags. The next thing we need to do is to create the API definitions for the InfColorPicker project. For the purposes of this walkthrough, we will use Objective Sharpie to generate the file ApiDefinition.cs. Objective Sharpie is a command line tool (provided by Xamarin) that can assist in creating the definitions required to bind a 3rd party Objective-C library to C#. In this section, we'll use Objective Sharpie to create the initial ApiDefinition.cs for the InfColorPicker project. 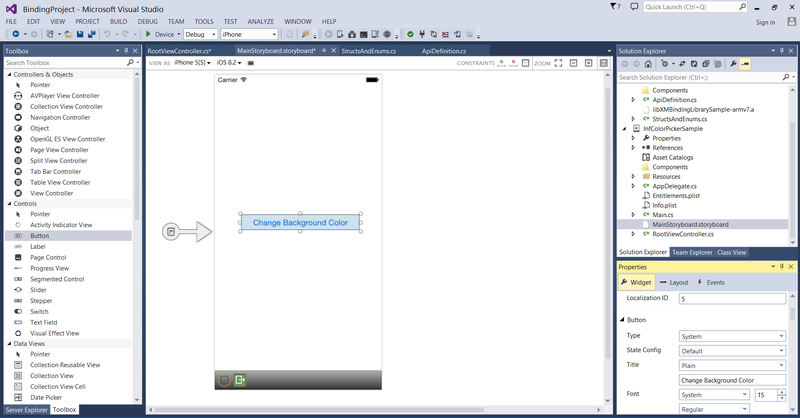 Objective Sharpie is a command line tool (provided by Xamarin) that can assist in creating the definitions required to bind a 3rd party Objective-C library to C#. In this section, we'll use Objective Sharpie on our Mac Build Host to create the initial ApiDefinition.cs for the InfColorPicker project. To get started, let's download Objective Sharpie installer file as detailed in this guide. Run the installer and follow all of the onscreen prompts from the install wizard to install Objective Sharpie on our development computer. xcode    Get information about Xcode installations and available SDKs. xcode - This tools gives us information about our current Xcode install and the versions of iOS and Mac APIs that we have installed. We will be using this information later when we generate our bindings. bind - We'll use this tool to parse the .h files in the InfColorPicker project into the initial ApiDefinition.cs and StructsAndEnums.cs files. From the above, we can see that we have the iphoneos9.3 SDK installed on our machine. With this information in place, we are ready to parse the InfColorPicker project .h files into the initial ApiDefinition.cs and StructsAndEnums.cs for the InfColorPicker project. Where [full-path-to-project] is the full path to the directory where the InfColorPicker Xcode project file is located on our computer, and [iphone-os] is the iOS SDK that we have installed, as noted by the sharpie xcode -sdks command. Note that in this example we've passed *.h as a parameter, which includes all the header files in this directory - normally you should NOT do this, but instead carefully read through the header files to find the top-level .h file that references all the other relevant files, and just pass that to Objective Sharpie. Open both of these files in the Binding project that we created above. Copy the contents of the InfColorPicker.cs file (from the Mac Build Host) and paste it into the ApiDefinition.cs file, replacing the existing namespace ... code block with the contents of the InfColorPicker.cs file (leaving the using statements intact). You may also find that Objective Sharpie has annotated the binding with [Verify] attributes. These attributes indicate that you should verify that Objective Sharpie did the correct thing by comparing the binding with the original C/Objective-C declaration (which will be provided in a comment above the bound declaration). Once you have verified the bindings, you should remove the verify attribute. For more information, refer to the Verify guide. At this point, our binding project should be complete and ready to build. Let's build our binding project and make sure that we ended up with no errors. When asked, copy the .xib file into the project. 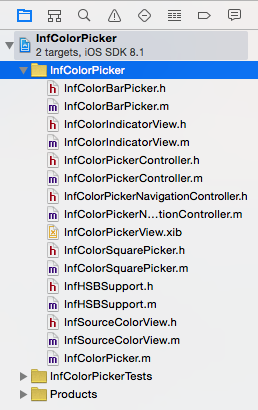 Add the InfColorPickerView.xib - The InfColorPicker Objective-C library includes a .xib file. Xamarin.iOS will not include this .xib in the binding project, which will cause run-time errors in our sample application. 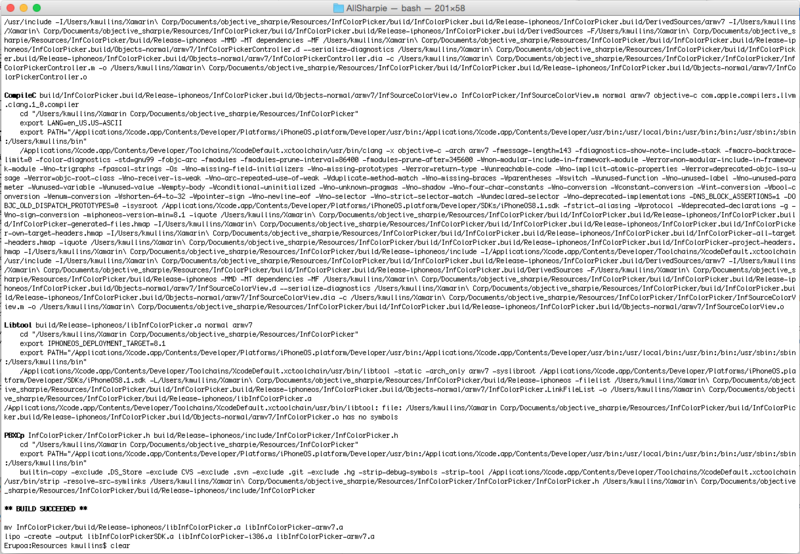 The workaround for this is to add the .xib file to our Xamarin.iOS project from our Mac Build Host. 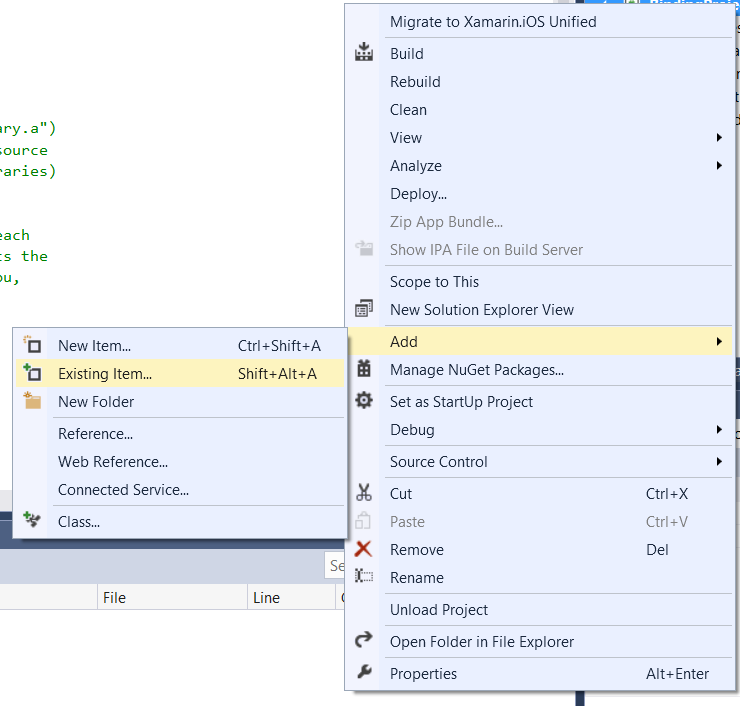 Select the Xamarin.iOS project, right-click and select Add > Existing Item..., and add the .xib file. Next, let's take a quick look at Protocols in Objective-C and how we handle them in binding and C# code. In Objective-C, a protocol defines methods (or messages) that can be used in certain circumstances. Conceptually, they are very similar to interfaces in C#. One major difference between an Objective-C protocol and a C# interface is that protocols can have optional methods - methods that a class does not have to implement. Objective-C uses the @optional keyword is used to indicate which methods are optional. For more information on protocols see Events, Protocols and Delegates. // This is only called when the color picker is presented modally. 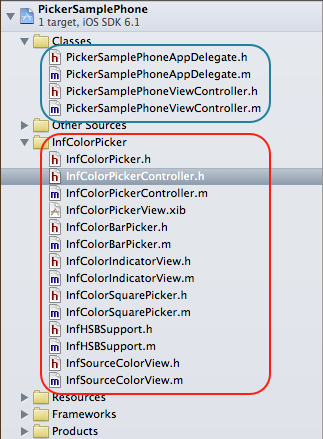 When the binding library is compiled, Xamarin.iOS will create an abstract base class called InfColorPickerControllerDelegate, which implements this interface with virtual methods. Strong Delegate - Using a strong delegate involves creating a C# class that subclasses InfColorPickerControllerDelegate and overrides the appropriate methods. InfColorPickerController will use an instance of this class to communicate with its clients. Weak Delegate - A weak delegate is a slightly different technique that involves creating a public method on some class (such as InfColorPickerSampleViewController) and then exposing that method to the InfColorPickerDelegate protocol via an Export attribute. Strong delegates provide Intellisense, type safety, and better encapsulation. For these reasons, you should use strong delegates where you can, instead of a weak delegate. In this walkthrough we will discuss both techniques: first implementing a strong delegate, and then explaining how to implement a weak delegate. 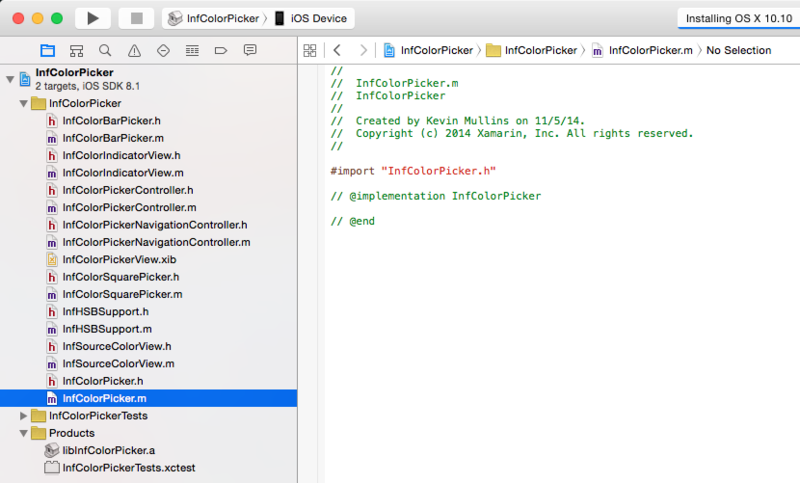 Xamarin.iOS will bind the Objective-C delegate by creating an abstract base class called InfColorPickerControllerDelegate. Subclass this type and override the ColorPickerControllerDidFinish method to access the value of the ResultColor property of InfColorPickerController. We first obtain an instance of InfColorPickerController via a static method, and make that instance aware of our strong delegate via the property InfColorPickerController.Delegate. This property was automatically generated for us by Objective Sharpie. Finally we call PresentModallyOverViewController to show the view InfColorPickerSampleViewController.xib so that the user may select a color. Congratulations! 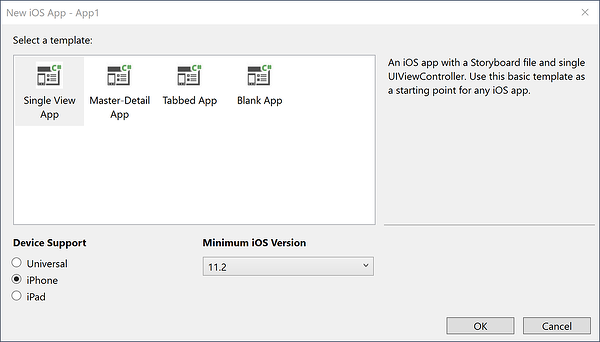 At this point you've successfully created and bound an Objective-C library for use in a Xamarin.iOS application. Next, let's learn about using weak delegates. Instead of subclassing a class bound to the Objective-C protocol for a particular delegate, Xamarin.iOS also lets you implement the protocol methods in any class that derives from NSObject, decorating your methods with the ExportAttribute, and then supplying the appropriate selectors. When you take this approach, you assign an instance of your class to the WeakDelegate property instead of to the Delegate property. A weak delegate offers you the flexibility to take your delegate class down a different inheritance hierarchy. Let’s see how to implement and use a weak delegate in our Xamarin.iOS application. Run the application. It should now behave exactly as it did before, but it's using a weak delegate instead of the strong delegate. At this point you've successfully completed this walkthrough. 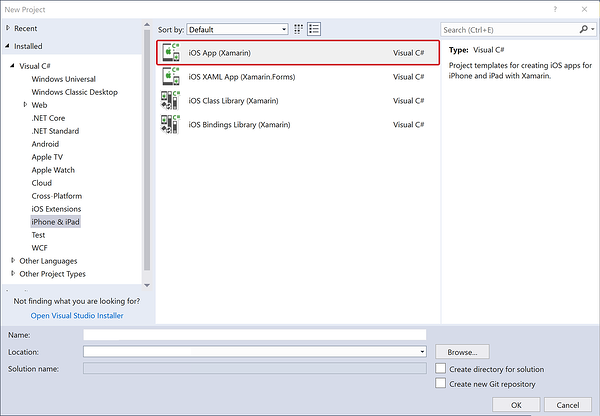 You should now have an understanding of how to create and consume a Xamarin.iOS binding project. 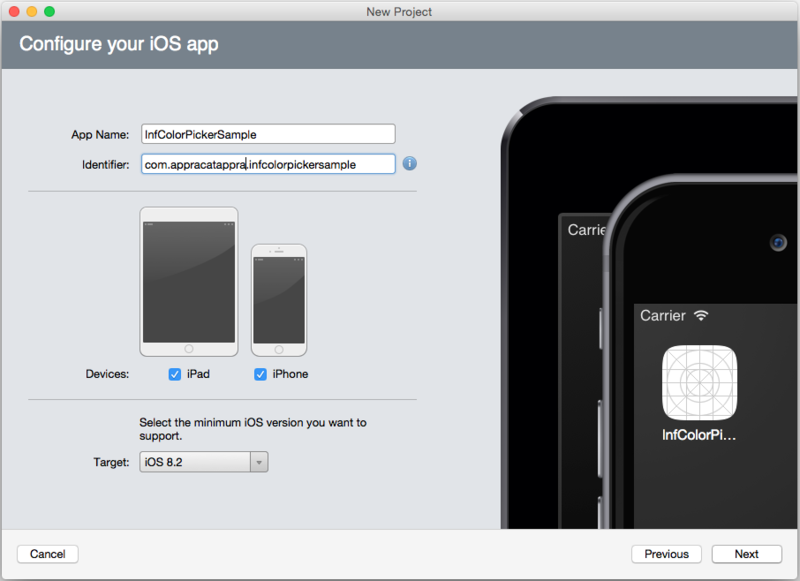 This article walked through the process of creating and using a Xamarin.iOS binding project. First we discussed how to compile an existing Objective-C library into a static library. Then we covered how to create a Xamarin.iOS binding project, and how to use Objective Sharpie to generate the API definitions for the Objective-C library. We discussed how to update and tweak the generated API definitions to make them suitable for public consumption. 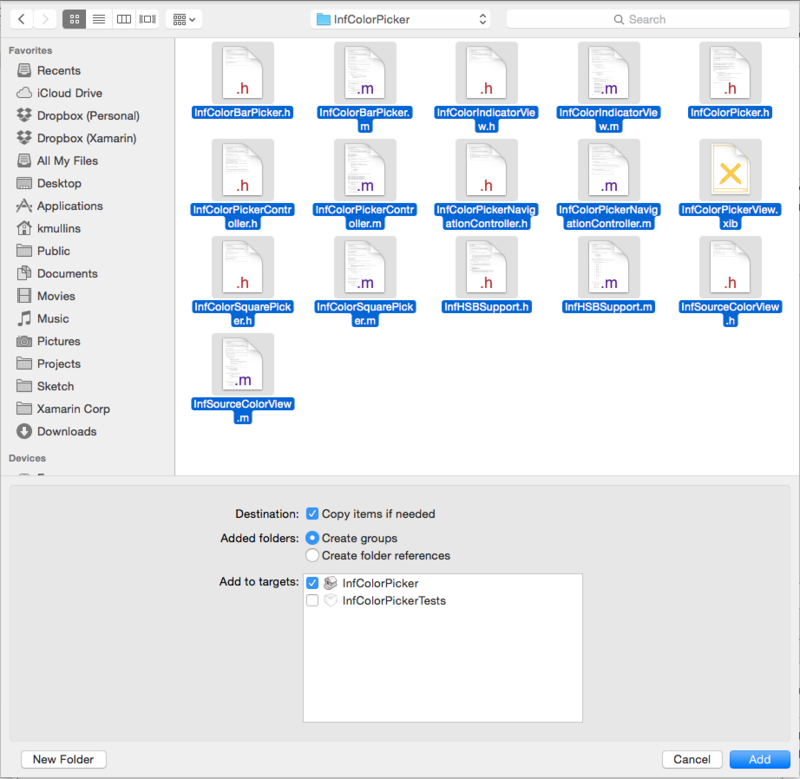 After the Xamarin.iOS binding project was finished, we moved on to consuming that binding in a Xamarin.iOS application, with a focus on using strong delegates and weak delegates.